Aware that he would be closely scrutinized, Washington self-consciously chose clothing and household furnishings that would convey a particular message about his style and character. The enthusiastic crowds who flocked to Washington’s first inauguration could purchase souvenirs marking the historic occasion. This commemorative copper button features Washington’s initials in the center, encircled by the words “Long Live the President.” A chain surrounds the button’s rim, with a link representing each of the original thirteen states. This design repurposes language familiar to those who had lived under the English monarchy (“Long Live the King”) and emphasizes Washington’s role as unifier of the American colonies. 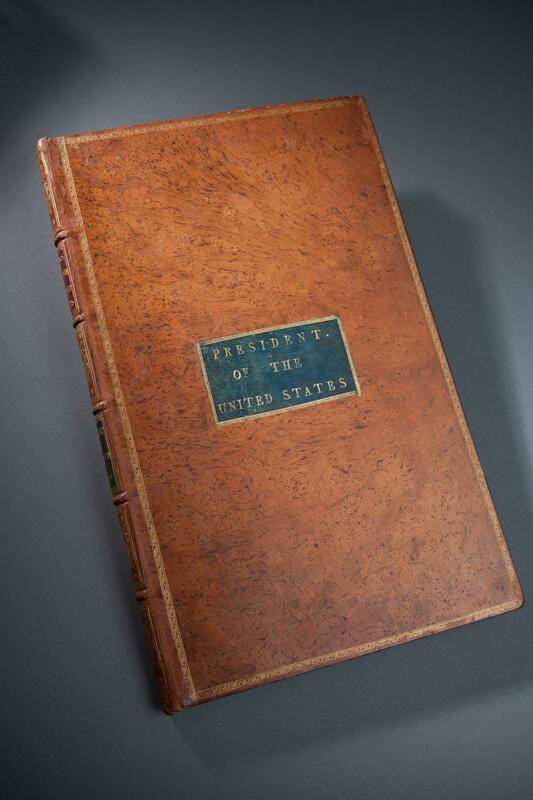 In 1789 George Washington received this custom-bound copy of the Acts of Congress, which included the Constitution and the Bill of Rights. His signature appears on the title page, and he pasted his engraved armorial bookplate on the inside front cover. In a highly unusual move, Washington made several annotations in the margins of this volume (he typically took notes on separate sheets of paper while reading). In the text of the Constitution, he marked the passages relating to the powers of the President, clearly preparing for the unprecedented leadership role he had recently assumed. 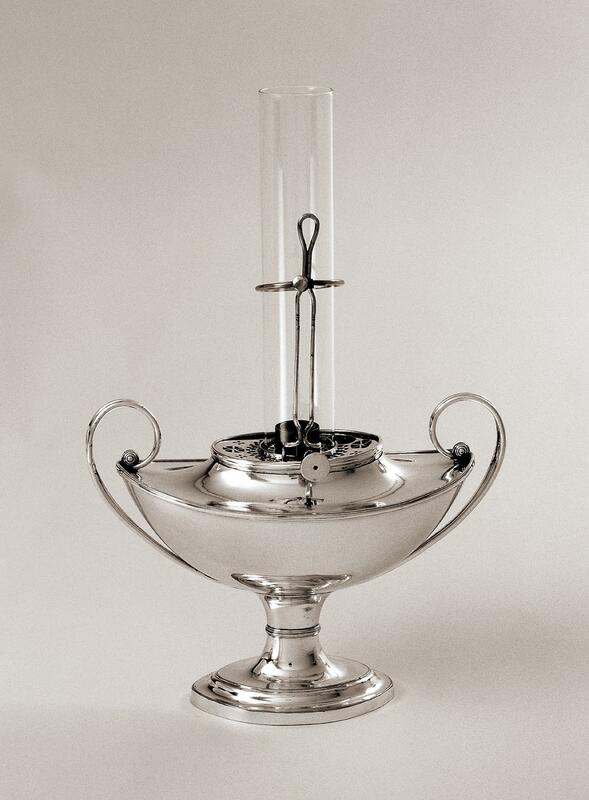 This neoclassical silver-plated Argand lamp is one of fourteen that Gouverneur Morris bought for George Washington in London in 1790. Eager to have elegant furnishings as well as the latest technology in his executive residence, Washington specifically asked Morris to purchase “patent lamps” after seeing them at the home of a Philadelphia merchant. Patented by Swiss inventor François-Pierre Aimé Argand in 1780, these lamps used a tubular wick and glass chimney to improve airflow, thus creating a light source that was brighter, longer-lasting, and less smoky than earlier oil lamps and candles. In furnishing his executive residences, George Washington wanted to convey that Americans were not unsophisticated and provincial, as European stereotypes often portrayed them. In 1790, when French minister Elénor-François-Elie, Comte de Moustier returned to Europe, Washington took over his New York City residence and purchased many of its stylish French furnishings. 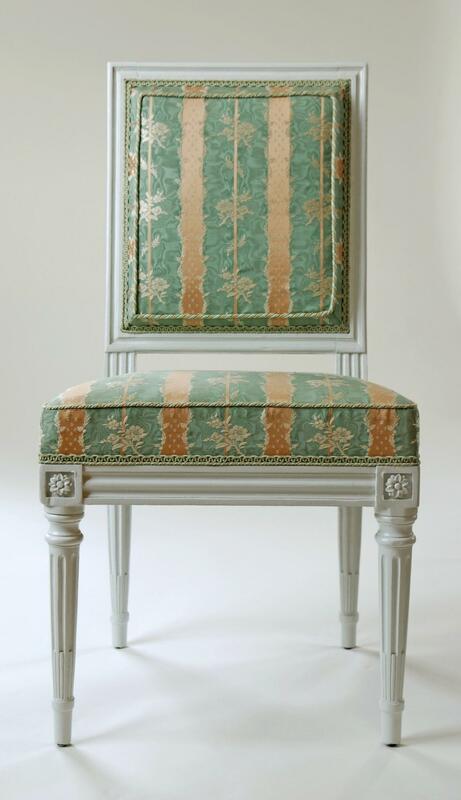 Items like this upholstered side chair, part of a matching set, demonstrated to visitors that the American president maintained elegantly appointed interiors despite his distance from the style centers of Europe. The white paint and green and yellow silk upholstery are modern treatments. 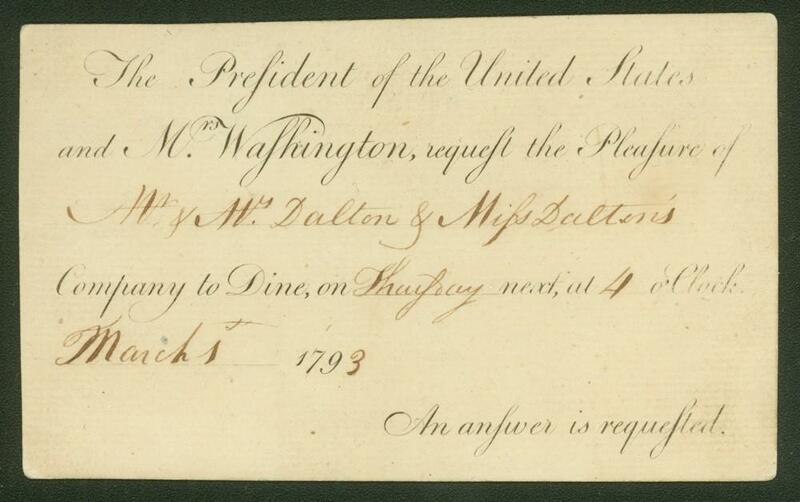 Forging relationships through hospitality comprised a key part of Washington’s duties as president. 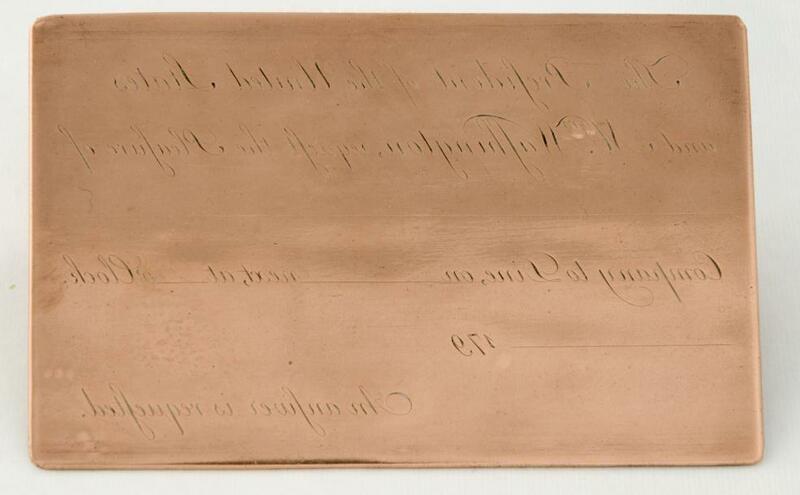 He and Mrs. Washington hosted dinners so frequently that their household staff used an engraved copper plate to print invitations in advance, filling in the specific date and recipient as the occasion approached. Every Thursday afternoon at four o’clock the Washingtons welcomed ten to twenty Congressmen, foreign dignitaries, and members of the cabinet for multi-course dinners. Alliances with Native American tribes were extremely important to the young United States. 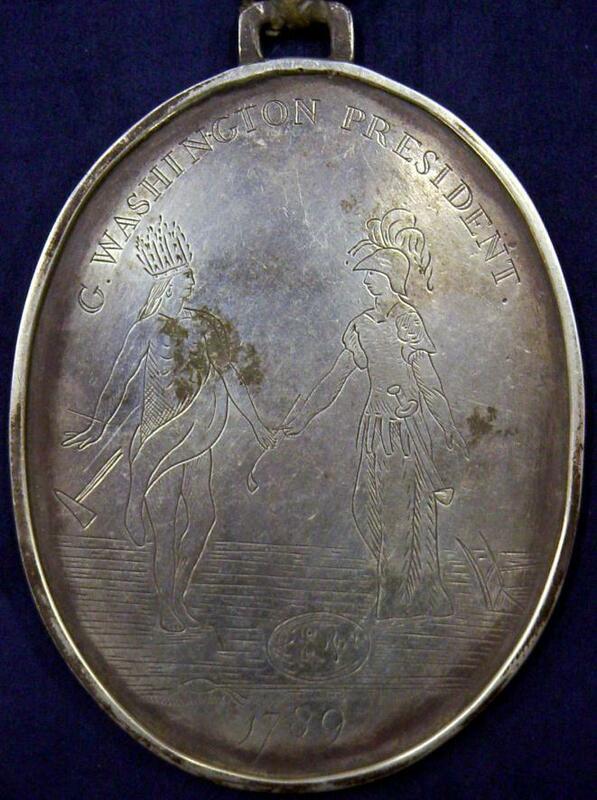 George Washington’s administration presented silver peace medals to Native American leaders as gestures of goodwill and attempts to cultivate loyalty to the U.S. government. The design of the 1789 peace medal featured a Native American chief and a classical warrior. 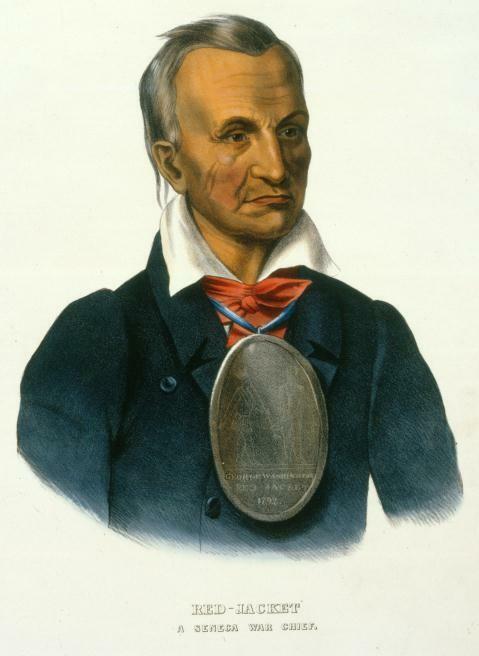 Such gifts were prized possessions among Native leaders, who often wore the medals around their necks as symbols of power, as depicted in this portrait of Seneca chief Red Jacket. Washington presented Red Jacket with a silver peace medal of the 1792 design, which replaced the classical warrior with a figure of Washington himself. As President, Washington knew that he played an important role in influencing the taste of the nation. 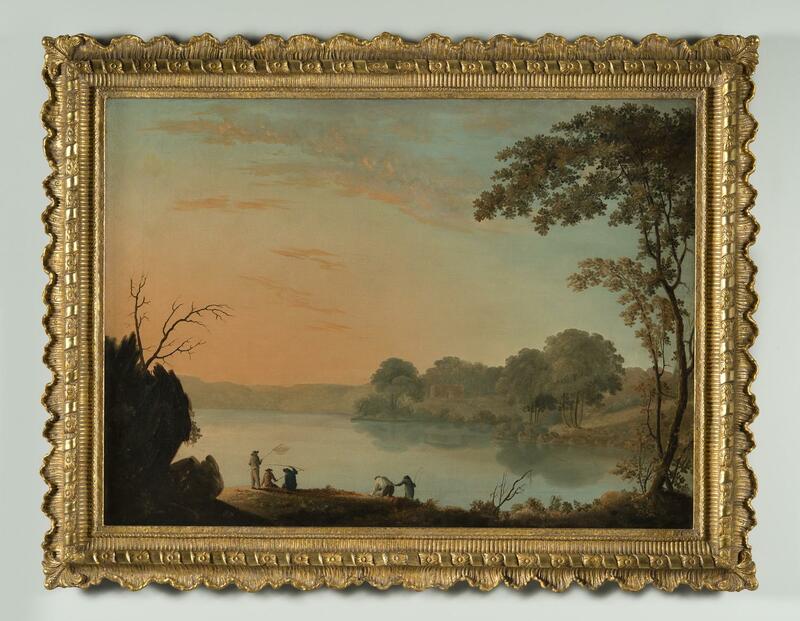 His 1793 purchase of two scenes of the Hudson River by English artist William Winstanley established Washington as one of the earliest patrons of American landscape painting (a genre that would not become widely popular until the 1820s). Washington displayed these paintings in the executive residence in Philadelphia and, in his retirement, hung them on the walls of the New Room at Mount Vernon for visitors to enjoy.